Provide comfort for the family of Stavro Spice with a meaningful gesture of sympathy. Stavro George Spice was born on Sept 19th, 1932 in Eli, Minnesota to Greek immigrant parents, George and Photene Spice. They later settled in Milwaukee where he was an MPS school teacher for over 35 years. But his true vocation came in retirement when he began writing articles and working as an art critic for The Shepard Express Magazine. He was a champion of the arts. There was nothing he loved more than talking about the intersection of art and culture. Films, opera, and classical music were his bliss. 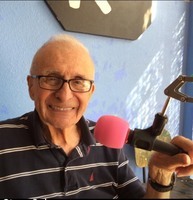 Steve hosted “Spicerack,” a weekly radio show on Riverwest Radio. A tribute show will happen this Thurs at 3:30p.m. 3:30-5:00 dessert and coffee and memory sharing/fellowship. Steve loved family holidays and appreciated honest discussions. He is survived by his only brother, James Spice, his nephew Chris Spice , his niece, Linda Spice D’Isabella, and his niece Shannon Sloan-Spice and their families. Steve is remembered by dear life-long friends and in laws. To send flowers in memory of Stavro G. Spice, please visit our Heartfelt Sympathies Store. We encourage you to share your most beloved memories of Stavro here, so that the family and other loved ones can always see it. You can upload cherished photographs, or share your favorite stories, and can even comment on those shared by others.